In the year 2009 double-dealing returned to Washington, DC. Shortly after his inauguration, President Barack Obama pledged to cut the nation’s annual budget deficit in half by the end of his first term. At the time, he identified exploding health-care costs as the chief culprit behind rising federal deficits. He warned that the country could not continue its current rate of deficit spending without facing dire economic consequences. He said, “I refuse to leave our children with a debt they cannot repay. … We cannot and will not sustain deficits like these without end. … We cannot simply spend as we please.” Yet within four short years, the USA’s sovereign credit rating has been downgraded three times, from AAA to AA(+) on August 5, 2011, to AA on April 15, 2012, and again to AA(-) on September 14, 2012. Talk is cheap. By September 20, 2012, after 44 month’s of empty words, health care costs have continued to rise. Having risen by 3.9% in 2010, health care costs are expected to rise by another 7.5% in 2013, or more than three times the projected rates for inflation and economic growth. 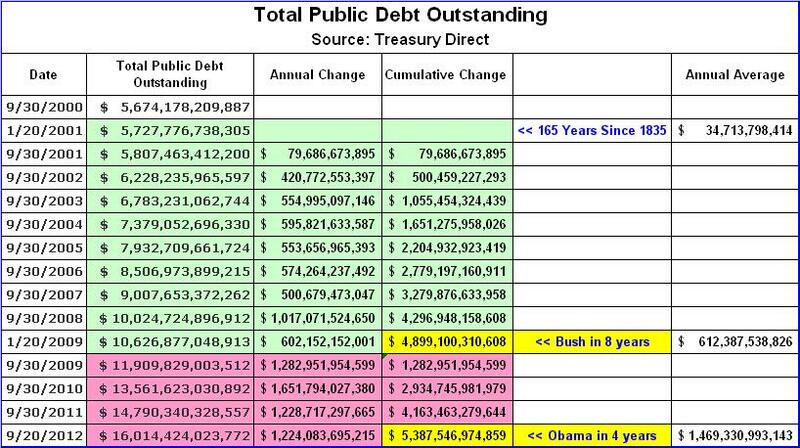 As if this wasn’t bad enough, the national debt has exploded by $5,387,546,974,859 in the last 44 months, resulting in an average annual increase of $1.5 trillion, versus an average of $612.4 billion during the presidency of George W. Bush (see chart below). And there are still four month’s to count until inauguration day. On Jan. 8, 1835, all the big political names in Washington gathered to celebrate what Democratic President Andrew Jackson had just accomplished. The national debt had been paid. It was the only time in history when the U.S. was debt free, and it lasted exactly one year. Back then like today, it wasn’t easy for politicians to slash spending — that is until Andrew Jackson came along. During the election of 1828, Jackson’s opponents referred to him as a “jackass”. 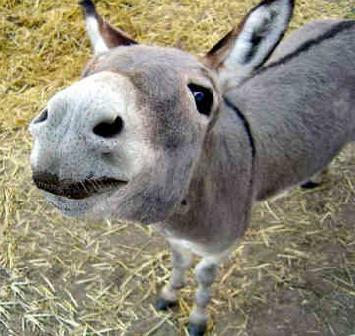 Jackson liked the name and used the jackass as a symbol for a while, but it died out. However, it later became the symbol for the Democratic Party when cartoonist Thomas Nast popularized it. But based upon the growth of the national debt over the past 44 months, the symbol no longer fits, or does it? “For Andrew Jackson, politics was very personal,” says H.W. Brands, an Andrew Jackson biographer at the University of Texas. “He hated not just the federal debt. He hated debt at all.” Before he was president, Jackson was a land speculator in Tennessee. He learned to hate debt when a land deal went bad and left him with massive debt and some worthless paper notes. Ah, so unlike Barack Obama, Andrew Jackson brought some practical business experience to the White House, just like Mitt Romney will. When Jackson ran for president, he knew his enemy: banks and the national debt. He called it the national curse. People ate it up. In Jackson’s mind, debt was “a moral failing,” Brands says. “And the idea you could somehow acquire stuff through debt almost seemed like black magic.” Yet if you listen closely to today’s Democratic Party, the national debt is no longer its enemy, but rather the anti-debt, fiscally responsible Tea Party. Andrew Jackson pledged to pay off the debt. In order to do so, he took advantage of a huge real-estate bubble that was raging in the Western U.S. The federal government owned a lot of Western land — so Jackson started selling it off. He was also ruthless on the budget. He blocked every spending bill he could. “He vetoed, for example, programs to build national highways,” Brands says. “He considered these to be unconstitutional in the first place, but bad policy in the second place.” But nowadays, we hear repeatedly from Barack Obama stuff like, “The House should put aside partisan posturing and pass the measure authorizing $109 billion in spending over two years. So much of America needs to be rebuilt right now. We’ve got crumbling roads and bridges…” In other words, forget about the credit downgrade, borrow and spend now, pay later. When Jackson took office in 1829, the national debt was about $58 million. Six years later, it was paid in full, and the government was running a surplus. This created a new problem: What to do with all that surplus money? So Jackson decided to divide it among the states. By the way, the phrase “the government was running a surplus” doesn’t mean the same thing as Bill Clinton’s four consecutive annual budget surpluses. Although that was a step in the right direction, the national debt was still over $5.7 trillion when he left office. Andrew Jackson was a stand up guy, he fulfilled his pledge. But unfortunately, the debt would only remain at zero for one year. 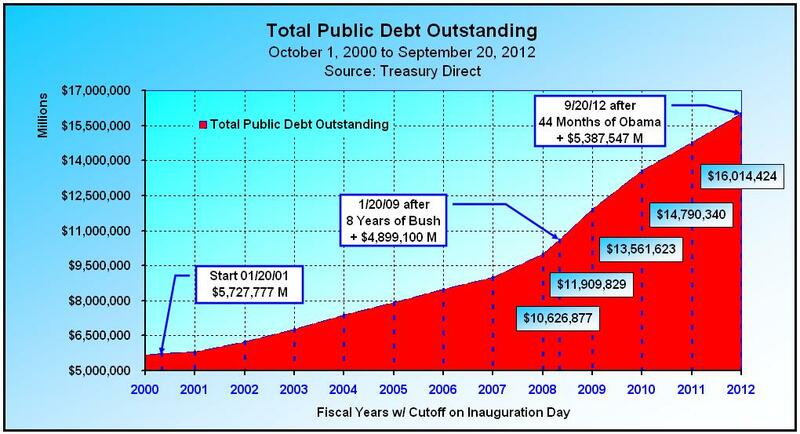 By January 20, 2001, the national debt had grown to $5,727,776,738,305. From the time Andrew “Jackass” Jackson paid it off, until the inauguration of Republican President George W. Bush, the national debt grew at an annual average of $34.7 billion over the ensuing 165 years. In the year 2000, George W. Bush was elected on a pledge to cut income taxes. By the end of his term, the national debt had grown by another $4.9 trillion — to $10.6 trillion or at an annual average of $612.4 billion over 8 years. Although in retrospect, most of the Republican Party finds his fiscal record detestable, it is notable that Bush never once pledged to pay down the national debt or cut the federal deficit. In fact the federal government was running at a slight surplus at the time of his election, so the federal budget wasn’t an election year issue. Nevertheless, the USA’s sovereign credit rating remained intact at AAA throughout both of his terms, and its debt-to-GDP ratio averaged around 62.4%. Finally in the year 2008, under the banner of Hope and Change, along came Barack H. Obama, portending to be all things to everybody. After making a solemn promise to cut the federal deficit in half by the end of his first term, many thought he represented the second coming of old Jackass himself. But instead, from the time of his inauguration the national debt has grown by an additional $5.4 trillion, not only exceeding the Bush presidency, but in double-time. That’s a fact! The national debt now stands at just over $16.0 trillion, having grown at an annual average of $1.5 trillion over the last 4 years. To top it off, the U.S. sovereign credit rating has been downgraded three times on his watch, from AAA to AA(+) on August 5, 2011, to AA on April 15, 2012, and again to AA(-) on September 14, 2012. Meanwhile, the U.S. debt-to-GDP ratio has risen to 104% and is projected to reach 110% a year from today. As Andrew Jackson put it, the national debt is “the national curse.” In the first 165 years after the debt was paid off in 1835, it rose by an average of $34.7 billion per year. And although it would increase by an average of $612.4 billion over the next eight years, during President Bush’s term, that doesn’t excuse President Obama. Besides, how can we hold Bush accountable for something he never pledged to do? Nonetheless, Barack Obama is on the ballot this year, not Bush. And he pledged to cut the deficit in half during his first term, but it has instead doubled. Your word is your bond. You might be thinking, “So what? We can’t afford to go back to the failed policies of George W. Bush, because that’s what caused health care costs to spiral out of control, and that’s the reason the debt was so high to begin with.” Yeah, like that makes sense. Stop listening to far-left lies and think for yourself. As a consequence of Barack Obama’s shortsightedness, the USA’s sovereign credit rating has been downgraded three times, from AAA to AA(+) on August 5, 2011, to AA on April 15, 2012, and again to AA(-) on September 14, 2012. Another downgrade or two and U.S. backed securities will no longer be suitable for many bond investors. And what happens when there are more sellers of U.S. backed debt than buyers? Interest rates will skyrocket. And what happens when interest rates rise? Everyone’s borrowing costs will increase, as will the USA’s annual budget deficits. Now it’s election time, and thus time to decide. Who’s to blame for Obama’s improvidence, Bush, the Republican Party, the Tea Party, or perhaps simply Obama himself? Well, allow me to spell out the American way. If you make a pledge and fail to deliver, there’s no one to blame but yourself. Not only did Obama fail to cut the deficit in half by the end of his first term, but the USA’s annual deficits have more than doubled, and its credit reputation has been trashed. Barack Obama has cursed the nation, and now is the time to cut his career short. And here’s my pledge, if we elect Mitt Romney and he screws up, I will personally help to expel the bum four years from now. But just for today, the ‘jackass’ in chief has got to go.